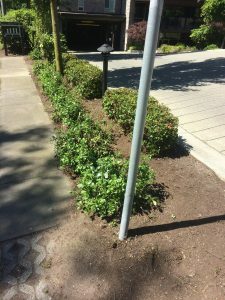 July 2017 - Proper Landscaping Inc. While working yesterday, I ran into a worker every landscaper loves to see. Hired by the strata council he was on dog drop duty. Great. That really helps. I wish these dog waste companies were hired more often. Yes, most of the dogs you see on site are adorable and many of their female owners are, too. But let’s be honest, some backyards are totally disgusting. So disgusting I actually have to include warnings in my training. I’ve seen new lawn care dudes totally paralyzed when the next yard they have to cut is completely covered in dog waste. So, if you can, mow around the piles. As the grass gets tall around the pile there is a chance the owner will get the hint. Several years ago I was confronted by the strata owner of a small patch of what used to be a lawn. He was angry because now he had a meadow. Obviously, as the strata landscaper I had to stay polite so I gently pointed out the massive piles of dog waste by now hidden in the tall grass. Nobody on the crew wanted to mow that yard. Incidentally, when grasses are allowed to mature, they can reproduce sexually. I doubt this even entered the owner’s mind. Now, he was really angry telling me there wasn’t anything buried in his lawn. And as he was saying this to me, he side-stepped along the wall, never actually stepping in his own meadow. Aha, case closed. If you have a weak stomach, skip this paragraph. Mower decks covered in dog waste are bad but nothing beats line trimming accidents. I openly admit to once slicing through an old improperly disposed of doggy bag. I have no idea how to describe the contents of an old doggy bag in language I can print. It’s a sick accident. No wonder I get excited when I see dog waste removal dudes. We mow around dog waste piles if possible. We skip totally covered yards. Some owners get notices; some get letters from strata council. All new workers are trained to line trim with goggles and their mouths closed. 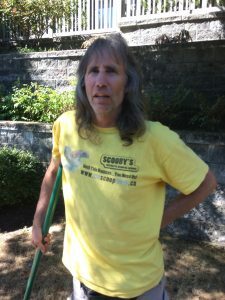 All workers have the right to refuse maintenance work in disgusting yards. 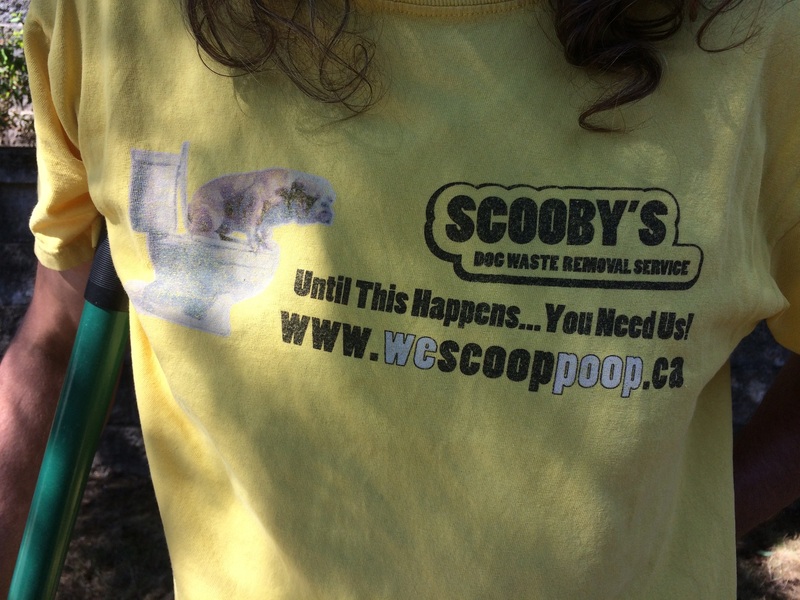 If you have a problem on site, definitely call a dog waste removal company. Your landscapers will love you for it. 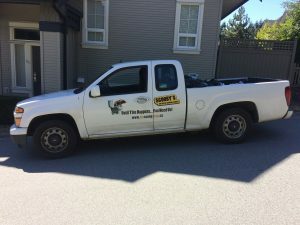 It’s been hot for weeks now in the Lower Mainland of British Columbia but this blog will take you back to last winter. The last winter we went through was the harshest in the last 30+ years. 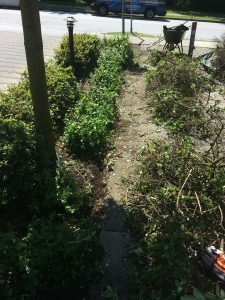 Consequently, many plants didn’t survive, namely Ceanothus and Choisya. So, many strata sites required heavy plant editing. We had to carry out the dead to make room for new plants; budgets allowing, of course. And budgets are tight. 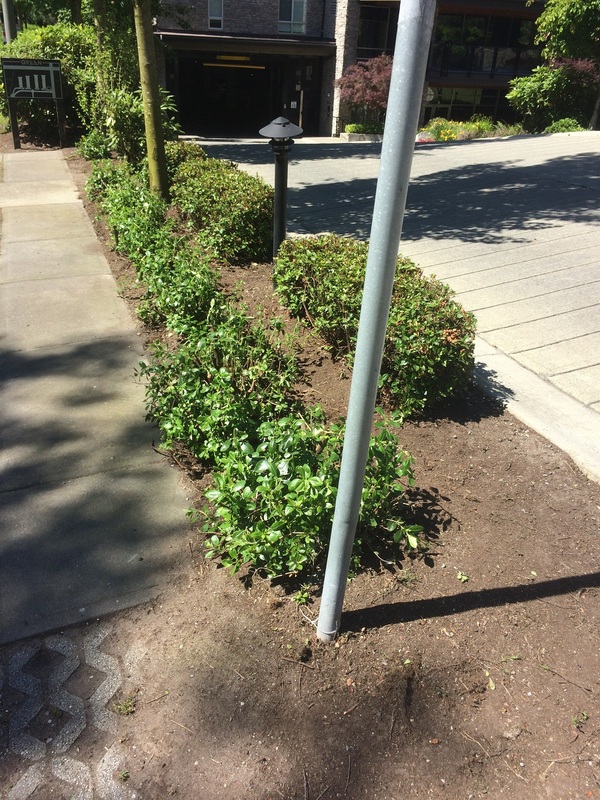 Many strata councils have many projects on the go and replacing dead plants probably wasn’t in the budget. One strata owner told me that his own building spent $21,000 just on snow removal last year. It’s a good idea for strata councils to budget for snow removal because global warming is bringing lots of changes. Walking through one particular site we had to toss many Ceanothus thyrsiflorus (California lilac). 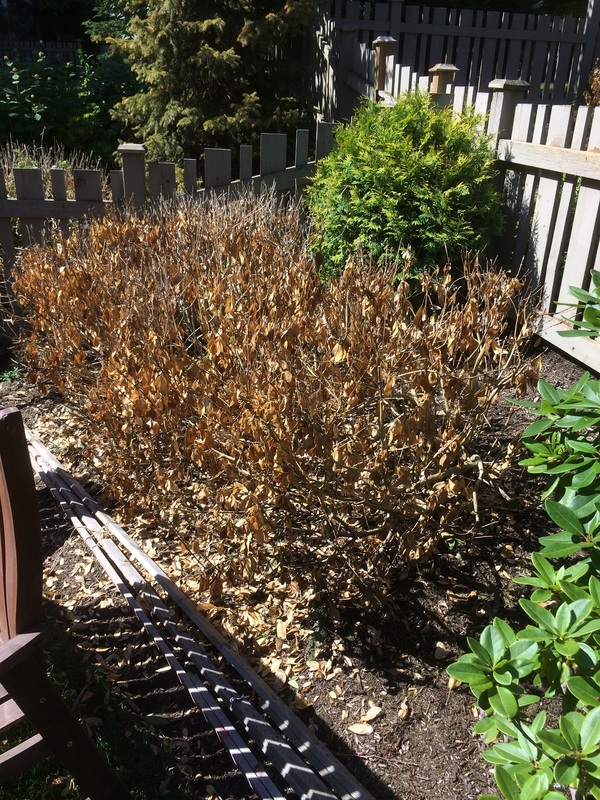 They are already marginal in the Vancouver area and one especially crazy winter killed them. Choisya ternata also got hammered. 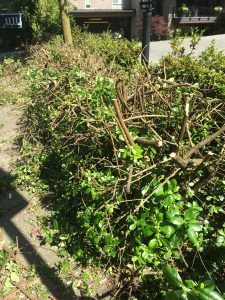 Since residents were alarmed we had to toss many of these brown hedges. And quickly. Then we reached many Escallonias beat up by snow and low temperatures. So what do you with this mess? Complete removal is one obvious choice but it would leave a huge hole. If you take a good look you will see growth at ground level. With life at ground level this calls for renovation pruning. First we take out power shears and we remove as much dead as we can. It’s harsh on the blades but it saves time on hand pruning later. We hand snip all remaining dead stems above the ground level green growth. See how the “new” hedge emerges. Last we do a nice clean-up and blow the area. Now let’s take a look at the finished renovated Escallonias. We saved the hedge from complete obliteration, thereby saving the strata council money. Passersby won’t even notice that the plants are down by half. I expect them to grow again and flower as if nothing happened. Hopefully, this coming winter will be gentle with them. I have also done renovation pruning on rhododendrons. It’s very hot in our July British Columbia landscapes and plants need help. 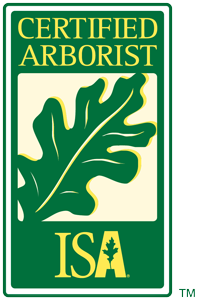 Trees are plants so let’s help them with some supplemental water. One great invention is the Gator watering bag. A Gator watering bag in action. They work best when they are filled with water. Full marks to this dedicated home owner. You don’t need any tools to install the bag. Just put the bag around your tree and zip it up. Then add water. The slit is located under the label tag. Once, when I was working for the City of Coquitlam, an elderly couple walked by and wondered how we get water into the bags. Just lift the tag. The Gator website states that new plantings require a refill every 5-7 days. The average watering time is 5-9 hours. And the benefits? No run-off and limited evaporation. You can use the bags to protect young trees which should limit losses and labour costs associated with tree planting. That said, some young trees still don’t survive. Perhaps they weren’t planted properly or came from inferior nursery stock. It would be great if this was the end of the story. 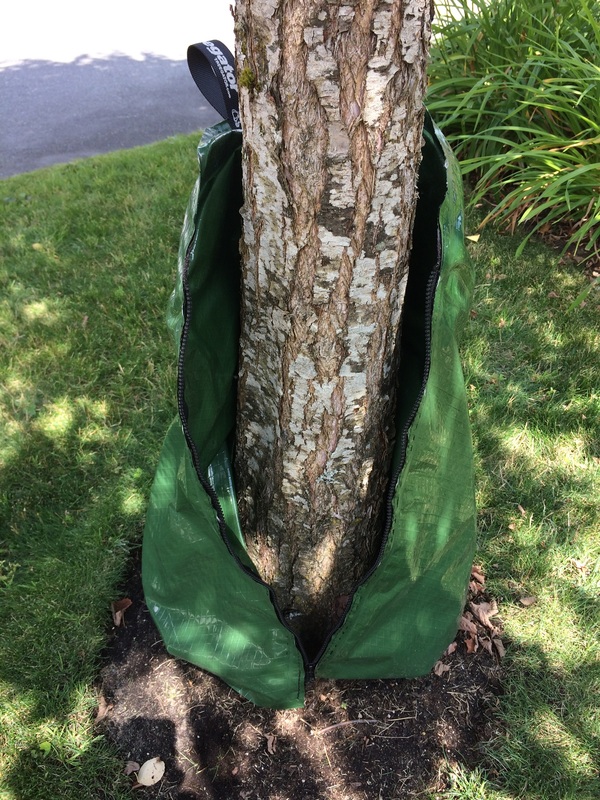 Bags go around the tree trunk and deliver much needed water boost to thirsty trees. Not so fast. Just last week I visited my favourite blog called the garden professors. It’s a special blog because people try to use good science to answer questions. a) Many watering bags were empty!? 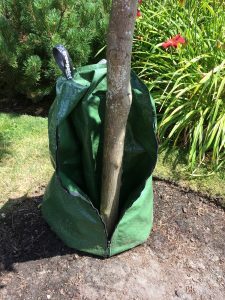 Since the bags were designed to deliver water to trees they should be filled with water. Obviously. b) A bigger problem was unzipping the bags and discovering bark rot. As the full bags press against the tree trunk they create moist and dark environment and, over time, this can lead to bark rot. 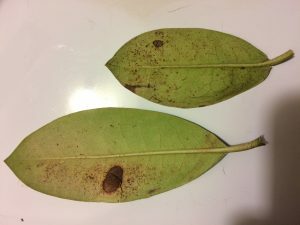 Rotting bark then invites diseases and pests. So I did my own survey on a large site we maintain. I found one tree with a moist bark section; some had bugs hiding under the zipper. All clear. The bark was dry and, alas, so was the bag. Think of the Gator watering bags as a temporary solution. 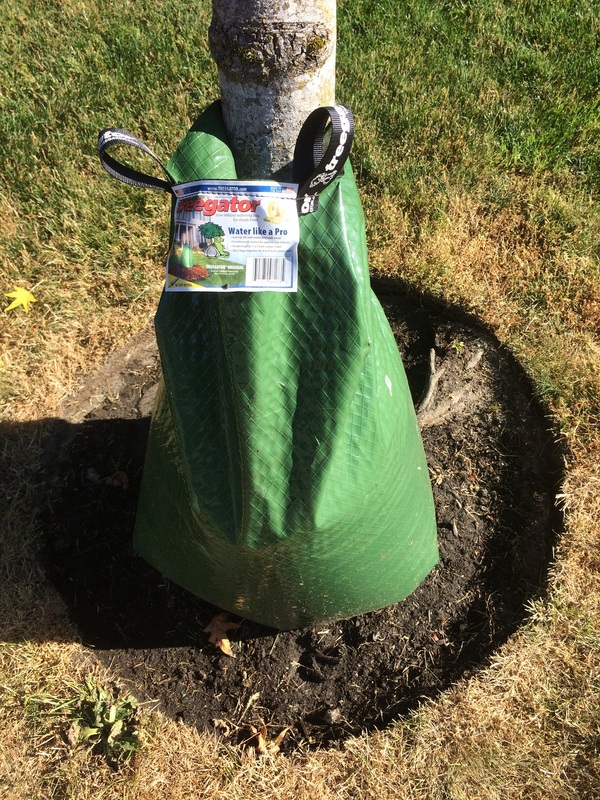 Install them, fill them up and check on the condition of the bark periodically by unzipping the bag. I hope your trees get through the summer heat without injury. As frequently happens, I get interrupted from my tasks to attend to strata owners’ requests. Today was a statutory holiday in British Columbia so we hit the site with a California-style mow-blow-go service. Of course, this also meant that residents who would normally be at work were home. And off we went to see the lady’s front entrance rhododendron. The owner said it’s been suffering with white flies for five seasons. She gives it fertilizer and prunes it twice a year to keep the height in check. It doesn’t flower much. Aha, I could feel a blog post brewing in my head. 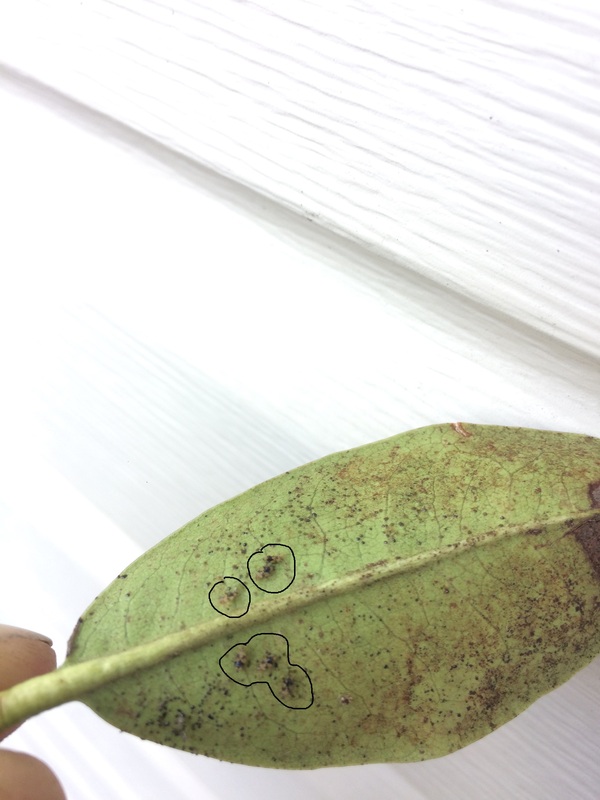 I examined the leaf undersides but found lace bugs instead of white flies. Since both bugs are sucking insects I knew sprays are usually employed to control them. So I snapped a few photos and made a note to do some research when I got home. I’m also fortunate to have great contacts to reach out to when I need help. One is municipal gardener Tracey Mallinson and another is Dr. Linda A. Gilkeson. The lace bugs are clearly visible. Clearly the work of sucking insects. Let’s examine the rhododendron. It appears to be in too-sunny a location. Rhododendrons in shadier spots don’t suffer as many infestations. 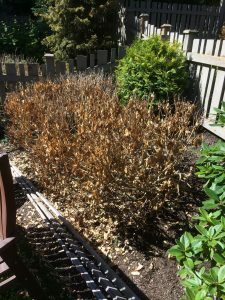 This goes for Azaleas and Pieris japonicas. The shrubs looks OK from distance but the insect damage is obvious up close. Flipping the leaves upside down, it was easy to spot the lace bugs. 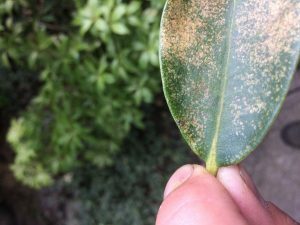 The Pieris japonica on the left is also affected. I have no idea how much rhododendron fertilizer the plant gets but I’m assuming the owner follows the label. Another suggestion online was to keep the roots moist. 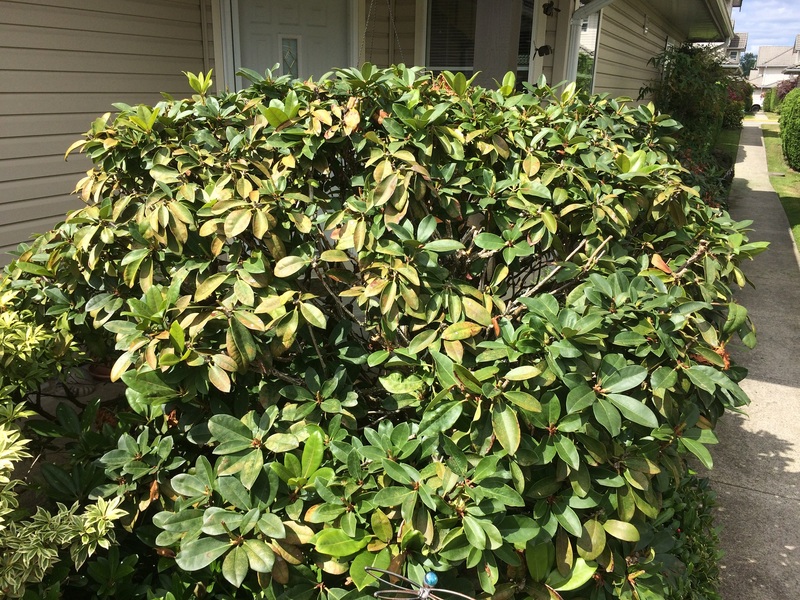 The owner prunes the rhodo twice a year to keep its height in check. She enjoys the privacy she gets but doesn’t want to be overwhelmed. This made me think of Japanese gardeners who refuse to prune trees and shrubs that show signs of weakness. Instead they ask the owner to nurse the plant back to health. Best course of action in July would be direct forceful blasts of water on the underside of leaves. I’m sure there are commercial insecticidal sprays but once you go the chemical route you’re stuck. Dr. Gilkeson states that the sprays must be repeated 10-14 days later and there is some danger that the sprays could burn the leaves. We don’t have that problem with water; water is also considerably cheaper. The best solution would be for natural predators to arrive and feast on the lace bugs. Patience!